stereotypes, there is one community that stands out and offers a refreshing change in perspective. These are your usual everyday Goans, who are giving adventure sports in Goa the kind of credibility that make people in this space take notice and even want to come to Goa just to try it out. This was the scene earlier this year, at a beach in South Goa; where you not only had people from other parts of India but also from Europe taking part in a sport, that leaves the audience awestruck. To some, these are the kind of ‘stunts’ seen in movies but to them it is a way of life and after you try it out, it doesn’t feel like a stunt at all. The name of this exciting sport is ‘Slacklining’ and it refers to the act of walking or balancing along a suspended length of flat webbing that is tensioned between two anchors. 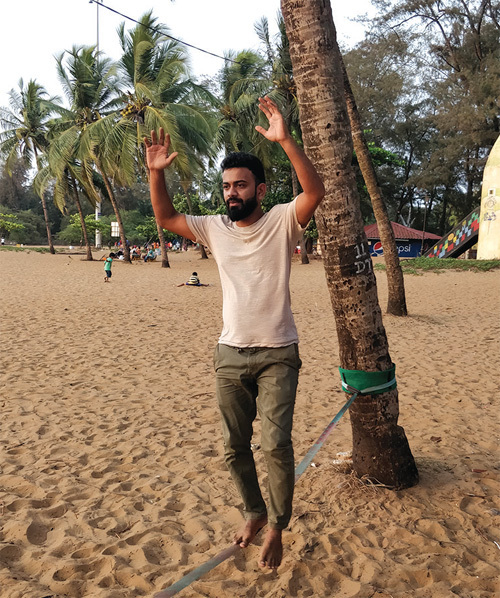 These two anchors could be two trees and given that every beach in Goa is dotted with them, it is only fitting that slacklining in Goa often takes place on the sandy shores. It is not limited to beaches alone but walking on a highline with the sounds and sight of the sea in the background can be quite the soothing experience, to say the least. Speaking about how this can help one physically and mentally, the Goa based group pointed out that it almost like ‘meditating on the line’. “It’s a sport which combines mental focus and physical balance. You can even term it as a true art of balance. Think of it as balance walking across/on a flatrope tied at a height above the ground. The line could be tied to trees, pillars etc. Further, to be able to slack, you really need to clean up all that mental clutter. It’s all about your mental focus and breathing. Of course it’s also a great core workout but it really makes you aware of your body and how you can use it to stay on the line,” says Anveer Mehta. It is also fitting, that you find people from the climbing community, skateboarding community and other adventure sports communities that are active in Goa, at these meet ups. Besides Anveer, others like Samuel Ferreira, Zhen Paintal, Ajey Patil, Anant Shirodkar, Surya Subramaniyam, Rea Burman, Hampus Olsson among others meet up regularly, while there are also a lot of people, that attend the setup and try it out for the first time. Clearly, it has generated a lot of curiosity among the public and is not being seen as a passing fad. In Goa, slacklining started with the skateboarding community somewhere late last year and has slowly grown ever since, captivating the imagination of many. “We meet regularly and also have slack meetups where we keep it open to more people to try it out. Our usual spot is at Miramar beach late in the evenings,” adds Anveer. “When we discovered it, we absolutely loved it. We wanted everyone to try it out because it’s really a lot of fun. Once you learn how to walk the line, you can improvise with different tricks or jumping on or off the line, mixing it with other art forms. Or setup the line much higher or over a swimming pool. There are endless possibilities!” says Samuel. While the sport has become extremely popular in several countries across the world, it is believed that the sport originated from the climbing community and that it spread on from there. In India, it caught on through some climbers and Samar Farooqui, who is India’s first pro slackliner. His company Slacklife, organises ‘Between years Slackline festival’ in Lonavala every year: A week long get together of slackliners across India and the world where they rig high-lines across the mountain faces and over ridges. At the international meet up in South Goa, Samar did the spectacular and walked on a highline over the ocean. At this event, there were a lot of interesting talking points such as the many different lines from 1 ft high to 50 ft high and 12m long to 80m long line setup. “It was absolutely amazing. Something you had to see to believe,” quipped Samuel. Speaking about what drives them and their future plans, Zhen pointed out that essentially it’s just about having a good time and a good healthy engagement activity to pass on to the others. “A lot of places in India now have a strong regular scene. It would be lovely to see a big growing community from Goa as well,” adds Zhen.